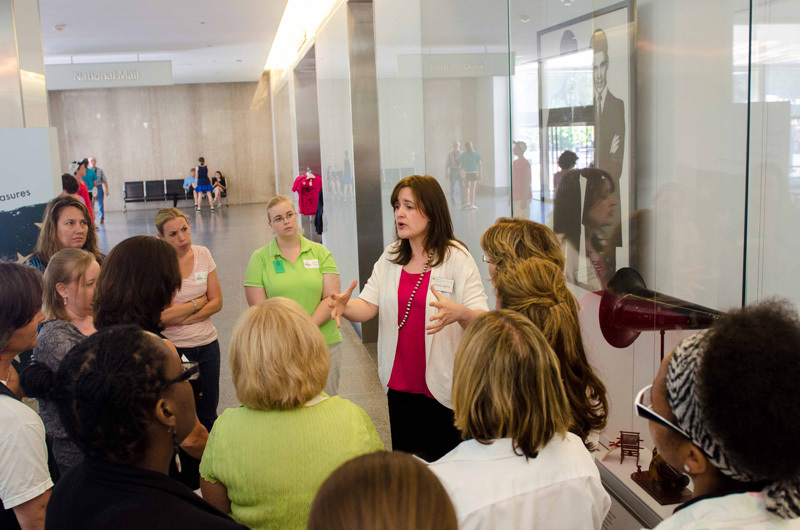 This summer, the Smithsonian’s National Museum of American History invites local educators with a passion for history and facilitating adult learning to join us for the Teach-it-Forward Institute. The program is free of cost with breakfast and lunch provided. Participants will go behind-the-scenes, working closely with museum educators, curators, actors, librarians, and archivists to develop content knowledge, explore resources, and learn hands-on and multidisciplinary skill building activities that are immediately applicable to standards-based teaching. We are accepting applicants on a rolling basis. Space is limited, so please apply at your earliest convenience. The institute will take place on July 29 & 30, 2019 for elementary and secondary teachers. All educators are eligible to apply. Our last cohort included art teachers, literature teachers, media specialists, librarians, science teachers, coaches, and special education teachers. Positive findings were consistent across grade levels, and included not just social studies teachers but also English, science, and art teachers, librarians, and other resource teachers. It was fun, engaging and well designed. It wasn’t just sit-and-get, but a mix of museum tours, drama, and lessons. I’ve been able to engage in more meaningful conversations with my students about perspective and it has helped shift them from self-central ideas to a broader understanding of historic events. I felt this program gave us not only resources but ideas on how to use them. In addition, we were given support and feedback to help us develop our lesson plans. This was an amazing professional development. I am so invigorated to use the strategies I learned and to share them with my colleagues. It refreshed my passion for history education. The opportunity to network with other teachers outside my district was highly beneficial. Please reach out to the National Museum of American History's Education & Outreach team with any questions: historyteachers@si.edu.